Here is the much awaited Nougat 7.0 ROM for Moto X 2014 CM14 (CyanogenMod 14). You might know that CyanogenMod is now continued as Lineage OS. Stay tuned to the Lineage OS 14.1 Devices list page to get more updates on Lineage OS ROMs. 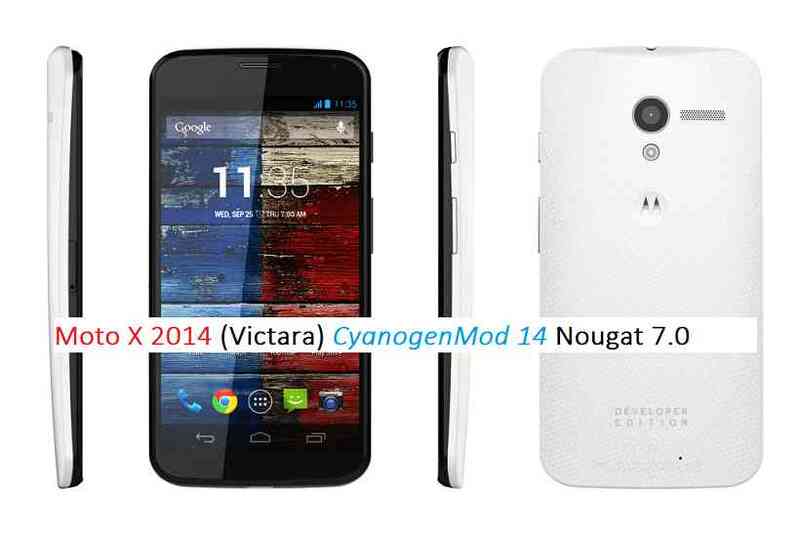 In addition to CM14 we also have the Lineage 14.1 for Moto X 2014 (victara). Since Google released Android Nougat Source code, we have update many Android NOUGAT AOSP ROMs and also many UNOFFICIAL CyanogenMod 14 ROMs and OFFICIAL CM14.1 ROMs. This CyanogenMod 14 for Moto X 2014 is brought to you by developer SeannyM along with invisiblek. In addition to this UNOFFICIAL CM14 ROM, now the OFFICIAL CM14.1 (CyanogenMod 14.1) for Moto X 2014 is also live. See the required downloads sections for the links(s). It is strongly recommended to update the OFFICIAL CyanogenMod 14.1 on the Moto X 2014. Download and Copy the Nougat GApps, CyanogenMod 14 Nougat ROM and the CM setup remover ZIP to Moto X 2014. First flash the Moto X 2014 CM14 ROM ZIP from device. Reboot and Enjoy the CyanogenMod 14 Nougat ROM on Moto X 2014. The development thread for Moto X 2014 CM14 ROM is here. Official CyanogenMod builds are no more as CyanogenMod itself is dead. CyanogenMod is continued as Lineage OS. So from now on there will be no CyanogenMod build available for any device. So as a user, you too need to migrate from using CyanogenMod to Lineage OS eventually. Anyway I have updated the last official CyanogenMod 14.1 NIGHTLY for Moto X 2014.